A Russian Progress cargo ship loaded with 2.8 tons of supplies and equipment blasted off from the Baikonur Cosmodrome in Kazakhstan Wednesday, streaked into orbit and carried out an automated rendezvous with the International Space Station, gliding to a picture-perfect docking five hours and 47 minutes after liftoff. The cargo ship's Soyuz booster engines ignited with a rush of flame at 5:44 p.m. EDT (GMT-4, 3:44 a.m. Thursday local time) and quickly throttled up to full thrust, pushing the rocket away from the launching stand into the plane of the space station's orbit. 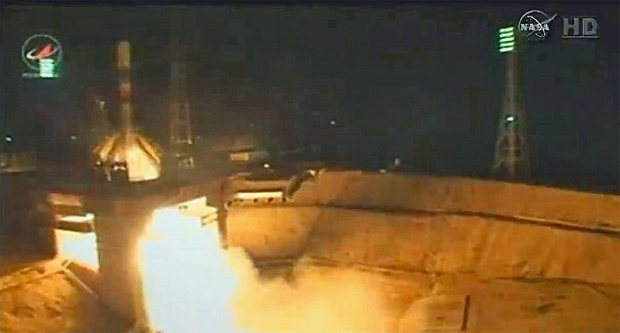 Eight minutes and 45 seconds later, the Progress M-24M spacecraft, the 56th Russian cargo ship launched to the station since assembly began in 1998, separated from the booster's upper stage. A few moments after that, navigation antennas and two solar panels unfolded as planned. The spacecraft then carried out nearly a dozen rocket firings over four orbits to catch up with the space station and properly position iteself for final approach. Following standard procedure, cosmonauts Alexander Skvortsov and Maxim Suraev stood by in the station's Zvezda command module, ready to take over by remote control if the cargo ship's guidance system ran into problems. 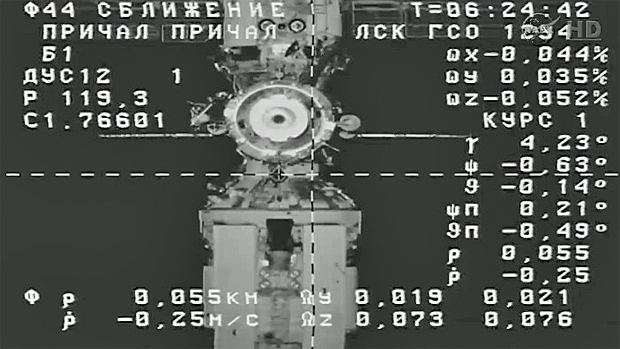 But the system appeared to perform flawlessly, guiding the Progress M-24M spacecraft to a smooth autonomous docking at the Earth-facing Pirs module at 11:31 p.m. as the two spacecraft sailed 259 miles above the Pacific Ocean west of Peru. "We have contact," a cosmonaut radioed as the docking systems engaged. "Congratulations, guys," a Russian flight controller replied. The cargo ship was packed with 1,764 pounds of propellant, 105 pounds of oxygen and air, 926 pounds of water and 2,910 pounds of supplies, spare parts and research hardware. The Progress M-24M spacecraft is the second of four cargo ships expected to arrive over the next two months following the successful launch and berthing of an Orbital Sciences Cygnus supply ship that reached the station July 16. The European Space Agency's fifth and final Automated Transfer Vehicle, or ATV, is on track for launch July 29, setting up a docking at the aft port of the Zvezda command module on Aug. 12. A SpaceX Dragon cargo ship is scheduled for launch from Cape Canaveral on Sept. 12, arriving at the station two days later. Between the ATV arrival and the SpaceX launch, the station crew plans to carry out three spacewalks, starting with a Russian excursion by Alexander Skvortsov and Oleg Artemyev on Aug. 18. Station commander Steve Swanson and Reid Wiseman plan to carry out a NASA spacewalk on Aug. 21 with a second U.S. EVA, by Wiseman and Alexander Gerst, on Aug. 29. Swanson, Skvortsov and Artemyev plan to return to Earth aboard their Soyuz TMA-12M ferry craft Sept. 11. Three fresh crew members -- Soyuz TMA-14M commander Alexander Samokutyaev, Barry Wilmore and Elena Serova -- are scheduled for launch from Baikonur on Sept. 25 to boost the station crew back to six.